From fragile to this-way-up even do-not-crush labels sold in retail packs of 10 or full trade rolls of 1,000 warning labels. All caution labels listed are available from our store in Coleshill or by next working day courier delivery, we can even rush your safety warning labels directly to you with our own local delivery vehicle. 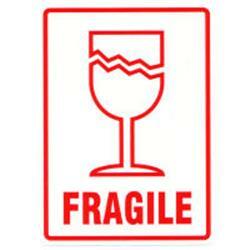 We have a wide range of warning labels and caution stickers for boxes and packaging and all in stock. 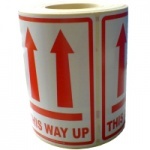 See our full range of high quality polypropylene (pp) or plastic warning labels, designed for industry as they are tear resistant and having a durable high tack adhesive they wont be easily ripped or peeled of even when wet. 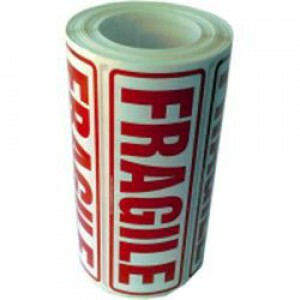 We sell the warning labels in packs of 10 or full rolls of 500 and 1000 warning labels, so if you need fragile, this way up or handle with care labels, they are all in stock for collection from our Birmingham shop or by courier on a next working day delivery. For more information on warning labels and caution stickers call our sales department today, we can take orders for your glass with care labels too.